The Denton Affair currently consists of over twenty acting members, technical members and members in training. 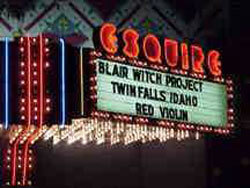 They perform at The Esquire Theatre in Clifton. The Denton Affair began at The 20th Century in Oakley over twenty years ago, where the show played a very limited run. Consisting of only two actors, the show then moved to the Skywalk Cinema in Downtown Cincinnati. The cast at the Skywalk enjoyed a good amount of success for quite a few years. Yes, those are some familiar faces in that Creatures of the Night photo, mainly Count Monty, Beakerman, a very young Jeff Whetstone, Walt, and original cast founders Tony and Scott. When the Skywalk closed, the cast and the show moved to The Real Movies. Booked there for a number of years, the cast stayed through a change of owners, and finally moved on to the Esquire when The Movies (as it was then renamed) closed for good.